"Look at me, Dad. Look who I've become." 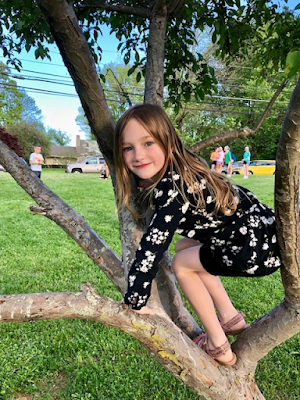 The Fort Washington Elementary School "Spring Fair" is one of a handful of banal events a parent is obliged to attend throughout the school year. I try not to hate these events. I try not to hate the triviality of the "games," where a kid is asked to pull a lollipop from a Styrofoam cone. I try not to hate the "crafts," the makeshift clappers constructed of cardboard and paper clips. I try not to hate the food: the congealed cheese of the pizza, the off brand Cheetos, the juice pouches with their impossible straws. And I try not to feel scorn for the parents. Dorks, I often think, even though I know how hard you have to fight to be cool in your forties--there's just so much working against you. "I mean, look at that father," I say to Karen. "Look at his cargo shorts, his pockets crammed with stuff, his wrap-around sunglasses!" Meanwhile, I'm on the sideline, in my skinny jeans and UltraBoosts. Who do I think I am? The white Drake? Of course, there's something else going at these events. There's the magic of the children, the unstructured zone of irresponsibility I remember from my childhood, when events of this sort were meaningful--the height of life, really. It was so comforting to know your parents were close, amidst your friends and teachers, yet not too close. For you had secrets, mysteries, private yearnings. Maybe you would run under the fields at dusk, breathless from speed and laughter. Maybe you would see the girl you loved. Maybe you would hold hands, even if for a second or two. And oh, the mementos, the lollipops and clappers that reminded you of the time! And the pride you could take in those moments, when you revealed yourself to your parents. Look at me, Dad. Look who I've become.